As a child I use to drink my mom’s coffee. She always kept Folgers Crystals, which is freeze dried instant coffee made to smell and taste like freshly brewed coffee. Today, I go for something a little different. When it comes to coffee, I seek out fair trade, organic and freshly roasted beans. Rise Up Coffee Roasters in Annapolis Maryland certainly delivers that and more! The menu consists of iced and hot beverages, muffins and a variety of pastries and quiche. They even serve a protein coffee smoothie. Sounds yummy! Rise Up Coffee’s philosophy: “The farmer who grew this coffee should receive the glory. We are among the fortunate who get to roast their beautiful coffees and share them with you. By staying committed to the time-honored craft of artisanal coffee roasting, we strive to make them proud”. Today, I ordered a half sweet dark chocolate mocha latte made with oat milk. It was beyond delicious. Not only that, the barista was very professional and took care in crafting my beverage. I have decided to become a coffee snob. 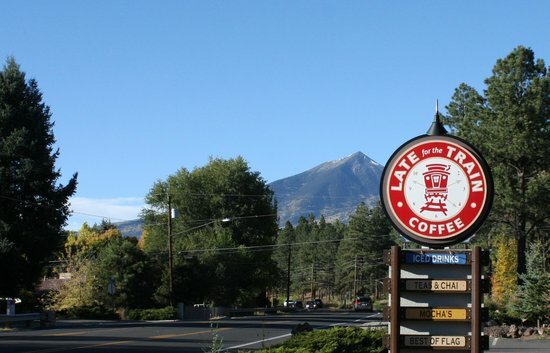 Truth be told, on any given day I will and have ordered and sipped coffee from fast food joints, gas stations, and out of those forbidden machines at any random 24 hour rest stop and have actually enjoyed it! I am admittedly coming out of the obscurity of drinking random, commercialized and manufactured beanery to a more discerning taste which reflects my coming of age (I just turned 50) and actively becoming more socially aware of the choices of coffee I make and why. Also, before I share my first experience with trying one of my most favorite drinks at an independently owned coffeehouse and after coming to terms with my age and my evolving taste buds I must first set the parameters of which I will engage in this search and quest for the java that jams! Foremost, it has to be a stark contrast to how, when and why I partake. No more driving up, convenience or coffee chains, and way more free/fair trade, fair and environmentally responsible and sound. Let’s also establish that coffee has become a good friend in the morning or early afternoon as the caffeine is just the jumpstart I need as I strive for that boost of clarity in my work as a consultant juggling multiple tasks, lists and errands. Another benefit is that I travel as a part of my work and sometimes the road can get monotonous. So, my plan will be to locate a small coffeehouse within walking distance of my hotel and stroll there to order my cup of joe. I will journal the taste, my in house experience and record the sights, sounds and smells! I am so excited! My first experience on this journey of becoming the coffee snob I have always wanted to be was a trip to Santa Cruz, California. I stayed at a chain hotel fairly close to the downtown area. I walked approximately 4,000 steps one way to my desired destination. The first lesson I learned is that not all cafes specialize in coffee. This place was quaint and nestled on a quiet corner but adjacent were my favorite kind of self-care stores full of sage, crystals, tie-dyed clothing and incense! I was in my element! It was certainly not a surprise to me that the cafe was named after Saturn, where the stars and solar worlds meet and clash and beam and glow. The streets on my way to the cafe where also lined with moon and stars, astrology and religion, rocks, wood and nature. I enjoyed this walk! So the coffee was organic, local and from fair trade! I am winning! Tres America was the brand and the taste was boldly smooth, earthy and took very well to cream and Splenda (look do not judge me, I am working up to trying other exciting sweeteners!) The environment was laid back and really cool, the average corner greasy spoon was more like it and I prefer so I had a dandy time! The service was amazing and the view out the window was equally pleasing. By the way, I tried the coffee hot and on ice and they both were pretty good! Wait, am I supposed to do that with the same brand of coffee? Snobs, fight me. LOL! Well, this is my first try at it, and I will continue to try and visit more cafes, coffee houses and baristas while I am on the road…I hope my sidewalk coffee stories will encourage readers to get some steps in, reflect on local beauty and business and taste the best coffee ever! I am not a coffee snob yet but I am too excited about what the future holds in becoming one! Categories: Uncategorized | Tags: California, coffee, Crystals, Fair Trade, incense, java, Joe, organic, sage, Santa Cruz, Saturn Cafe, splenda | Permalink. This summer we celebrated our 10th wedding Anniversary. To mark this most beautiful milestone we traveled to Crete (among other places). The Cretan coffee I had in the Village of Hersoniss was very nice and smooth. It had the consistency of hot chocolate. I am told that it is cooked on the stove in a small saucepan. In fact, the process for making coffee is very ritualistic and its preparation has been preserved for over 500 years. The coffee is always lightly roasted and finely ground. Equally important to this preparation is the temperature of the water being sure to never allow it to boil. I believe this lends to the smooth (never bitter) taste of coffee in Greece. Nyktaph Coffee and Bakery is located in Hersonissos. We visited this place twice. The second time we wanted an Afagato. The Barista found it interesting and had no idea what it was. So, we showed him how to make it and viola! He made it and served it with much enthusiasm. It may very well be the best ones we’ve had. Kenny had his with two scoops of pistachio gelato. I had a Greek inspired flavor that unfortunately I cannot pronounce😆😆😆. It reminded me of caramel with baklava🤗🤗. Yum! Although we did not try any of the pastries, I had to take pictures because they looked so tasty! The temperature was very hot in Greece. I needed something cold to drink. Here I am enjoying this Freddo, which is the Cretan version of an Iced Latte. The coffee culture in Greece is definitely becoming more and more popular. I hope that on our next visit we see Afagato on the menu. While on vacation in Honolulu, HI, I decided to stop by Kona Coffee Purveyors at the International Market Place. Anyone who knows me, knows that I am not very big on coffee, but over the past year, I have acquired a taste for different blends and types of coffee thanks to the amazing blogging of #esspressotrips and #sweetsations. I contacted Lady Dalton and requested to be a guest blogger due to my trip and wanted to share my experience. Let me begin by saying, that upon walking into Kona Coffee the selections were too many to choose from, so I chose the basic Croissant and for my drink I decided to try something new. I purchased the Kona Nitro, a carbonated cold coffee brew. I was skeptical at first and nervous about the first sip. OMG, it was so smooth going down even before I decided to add a little cream. I am not a fan of black coffee but THIS I would drink BLACK and be HAPPY (and pumped from the caffeine). Now, I do not want to forget about the croissant, it was so soft, fluffy, light and buttery. Better than any other croissant I have ever had!! I had the pleasure of joining a friend for this trip to Kona and she introduced me to what is called the Black Sesame Kouign Amannn. The Kouign Amann was sweet and perfectly textured. My pallet was pleased and I began to dance while enjoying just a small portion of the perfectly flavored pastry. Trying new things, is not me, but this trip to Kona was worth every part of my new tasting adventure. The pastries were made by b. Patisserie, a company that has partnered with Kona Coffee Purveyors. Good job in developing this partnership! If you visit Hawaii, please be sure to stop by Kona Coffee Purveyors! I promise that you will not be disappointed regardless of what you order!! Categories: Uncategorized | Tags: esspressotrips, Hawaii, Iced coffee. croissants, Kona Coffee Purveyors, nitro coffee | Permalink. 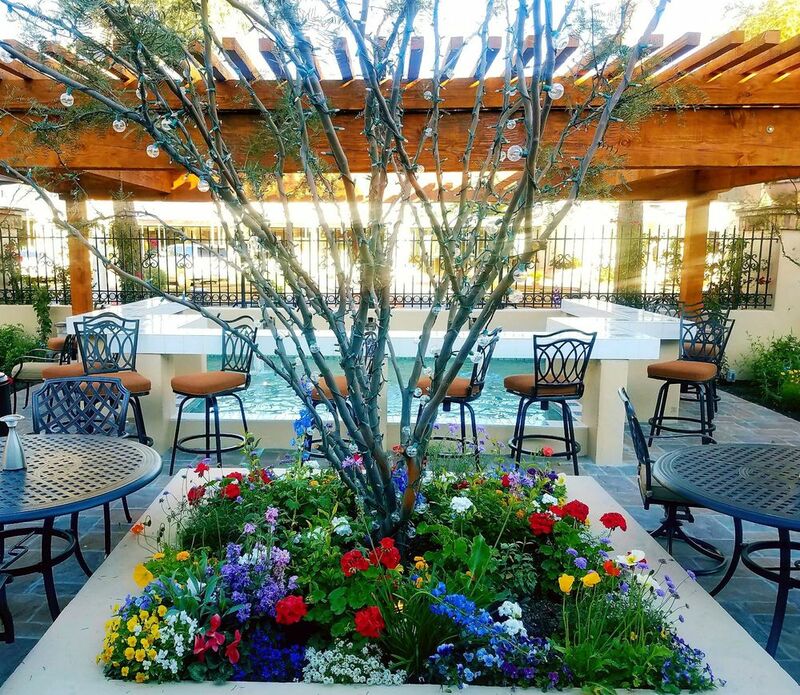 On a leisurely walk through Old Town Scottsdale (looking for coffee), I became captivated by the beautiful flowers pictured above. All of a sudden a lady came through these rod iron gates with what looked to be an iced coffee beverage in her hand. I curiously asked, “Where did you get that coffee? I am looking for a coffee house” She replied, “right through those gates.” I counted it as a blessing and moved through the gates quickly. What I found was nothing short of beautiful. It was a courtyard; a sanctuary of sorts. It was filled with more flowers and a lovely fountain with beautiful seating for all to enjoy. The excitement I felt was overwhelming because I knew a great coffee treat would be on the other side! So, with great expectation I perused the menu and spoke with the barista regarding iced beverages. I decided to order the cold brew, lightly sweetened with agave and a splash of half and half. My, my, my, it was amazing! Perfectly brewed. Perfectly balanced. Perfectly smooth! My experience here was extraordinary. 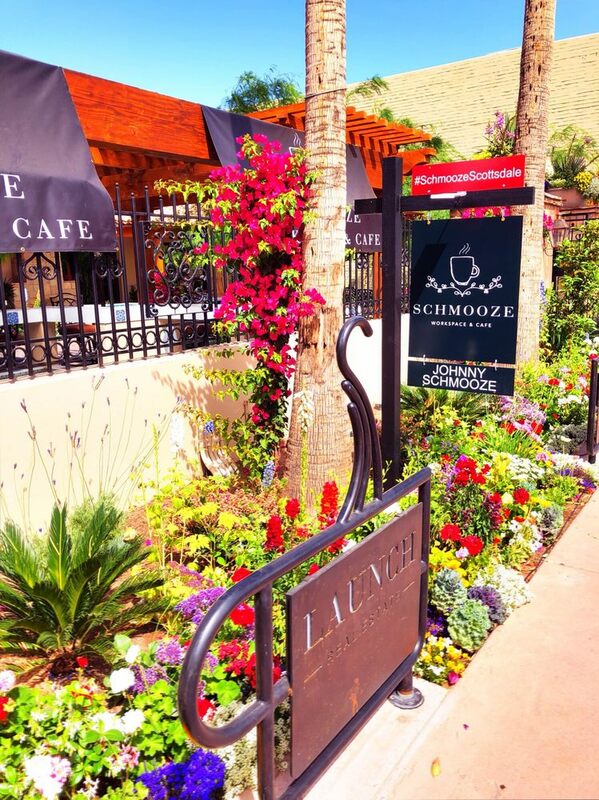 If you are ever in the Phoenix/Scottsdale area, check out Schmooze in Old Town Scottsdale. It was one of the best coffee venues I have visited. Categories: Uncategorized | Tags: AZ, cafe, coffee, cold brew, esspresso, esspressotrips, launch, Schmooze, Scottsdale, work, Work Space | Permalink. New Order Coffee Roasters is located on the ground floor of Midtown’s Crystal Loft Building and near Grey Ghost Detroit. From the moment you walk inside, their mission to “delight and energize your everyday life” is clearly evident. The decor alone will take you to a happy place. The color scheme is aqua, orange and white, almost giving you the feeling of being in a candy store. New Order is not your average coffee shop. They start off the right way by carefully selecting their beans and roasting them in small batches on site. However, what sets them apart is their fun and whimsical approach to making their beverages. Customers can order drinks like the Cereal Milk latte, lattes with flavor-infused homemade marshmallows and M&M ganache. New Order Coffee also offers sweet and savory pastries and specialty foods and candies. They offer several brew methods and have Nitro of tap too! On our visit, my husband and I order the Cracker Jack latte (…and yes, it came with a prized! LOL) and the Marshmallow latte. Both were terrific and the Frosted Flake milk had us feeling nostalgic. “Who thought of this?” I asked my Barista. She replied, someone who is truly a kid at heart! Yes indeed! Another really cool thing about this coffee shop is that customers can buy freshly roasted coffee beans right there on the spot! The roasting can be customized to suit their taste and they can walk out of the shop with a warm bag of beans to brew at home roasted just for them in minutes. How awesome is that? Categories: Uncategorized | Tags: Captin crunch, Cereal Milk latte, coffee, Cracker Jack Latte, esspresso, Frosted Flakes, java, Mid Town Detroit, New Order Coffee Roasters | Permalink.